Housework in the Dales in the interwar years was hard manual work without any of the labour saving devices we have today. Norman Swindlehurst describes home-brewing and how the family butchered their pigs and kept some joints hanging from the rafters inside the farm, until they were needed. Both he and Anne Margaret Mason describe baking days and how riddle bread and clap bread were made—a tasty treat for supper, says Norman. There are also many descriptions of cheese-making, an important part of life on a dairy farm. 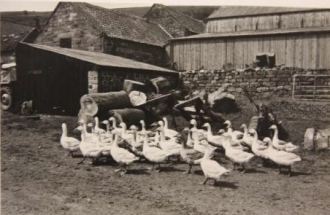 Anne Margaret Mason describes laundry day with a dolly stick, flat irons and charcoal irons, whilst Kit Calvert decribes how his family kept geese and poultry inside the house and fed them from the dinner table with titbits.